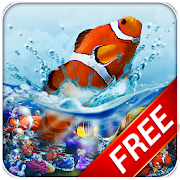 Aquarium Live Wallpaper is an amazing quality active wallpaper. Now you can have your aquarium always with you! The application has a very high quality graphics, all the details are worked out at the highest level. High resolution used elements allows for the use of wallpaper without loss of quality even on tablets. Fishes are moving very naturally, and some of them even shoals swim. Air bubbles and lighting effects make the aquarium looks very natural.